Countrywide Pre-Paid Legal Services has every reason to be proud of its attorneys. These folks combine excellent emotional intelligence expert and legal knowledge to deliver superior service. However, there is a limit to what they can do. The legal profession has become increasingly more specialized. Intellectual property, cyber-security, and immigration law are becoming more nuanced. The same can be said for adoption law and property disputes. Our lawyers may not have the legal skills to address complicated issues in the far corners of the law. Attorneys with special skills are needed and group legal plans do not always have them. Countrywide believes that serving a plan member is job one. If the existing pre-paid legal services can’t solve the problem, Countrywide will recommend a referral and make the needed contact. Group legal plan members like this, but they worry about the cost. Lawyers with a unique skill set will charge higher rates per hour. *Contingency fee cases are given a 10% discount from the standard contingency percentages. We will go a little bit further in making certain that all fees are appropriate. Every lawyer who works with us on a referral basis must provide Countrywide with a detailed fee schedule as part of the agreement. There are to be no hidden costs or hidden charges to any Countrywide group legal plan member. We can check the fee schedule to make certain that the other attorney lives up to the agreement. This scrutiny is our way of making sure that our clients are treated fairly. Countrywide will not compromise quality. We insist that our group legal plan members be treated well. Courtesy, patience, and respect must be part of the services the outside counsel provides. It is in addition to the primary status our clients are to receive. Our pre-paid legal services assist in many areas. It can happen that in an ordinary meeting the need for specialized help can be uncovered. For example, a legal document review (one of our options) may show a need for specialized legal opinions. 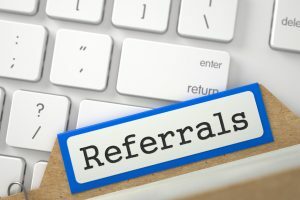 The required referral is then quickly made, and the plan member can get the additional help. The same can happen with our warranty and consumer protection services. It is up to the client to decide what benefit options are going to be in the group legal plan document. A client can decide to have a simple will drafted and help with government agencies, and perhaps one or two other options. We wish to make it clear that the client is going to decide. We offer advice, but the final plan is what the client wishes to have. We work with organizations of all sizes and have done so for more than 30 years. The ability to choose the benefit options enables the client to craft a pre-paid legal services plan which will assist as many employees as possible. We support the decision with excellent service. We have a streamlined administrative function that gets help delivered in a reasonable amount of time. Anyone who works with us, either within our network or our referral basis, must have high levels of emotional intelligence and empathy. We insist that service be combined with understanding and sympathy. While the legal advice is excellent, it is the superior personal skills of our attorneys that make Countrywide a leader in the industry. We encourage questions from interested parties. If you want to know more about our referral system or any of our benefits, please feel free to contact us at your earliest convenience. We believe that we have the right options to provide the best service for your employees.